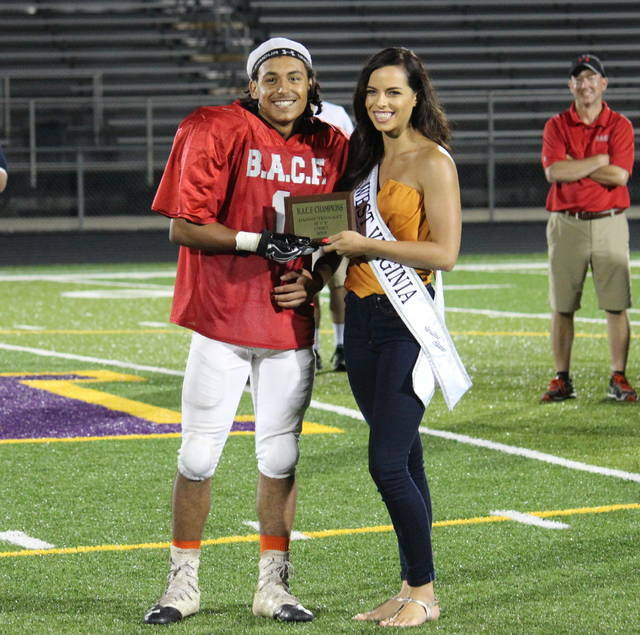 The Ohio all-star team is presented the 2018 B.A.C.F trophy by Miss West Virginia, Chelsi Rose, following Saturday’s contest in St. Mary’s, W.Va.
Point Pleasant’s Aaron Turner (6) runs the ball on a kickoff in the second half of the 25th annual B.A.C.F. all-star game on Saturday in St. Mary’s, W.Va.
ST. MARYS, W. Va. — Despite a team setback, a final game under the lights proved huge for one Big Blacks player. 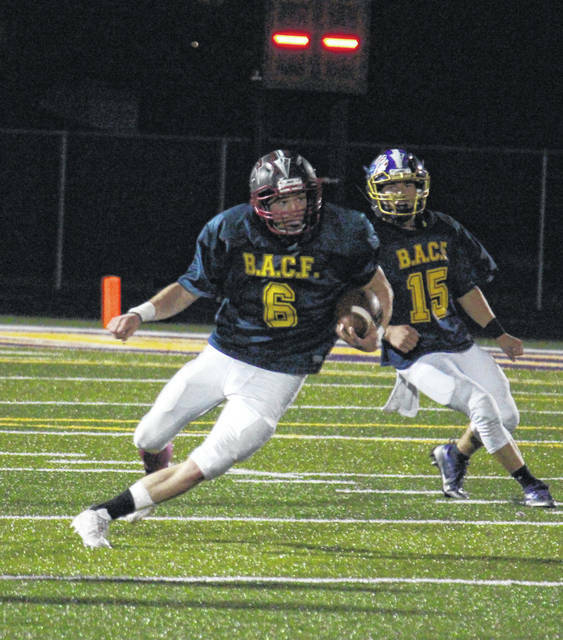 Recent Point Pleasant graduate Aaron Turner had one last appearance on the gridiron on Friday night, as he represented PPHS in the 25th annual Battle Against Cystic Fibrosis All-Star Classic in a at Bill Hanlin Stadium in Pleasants County. 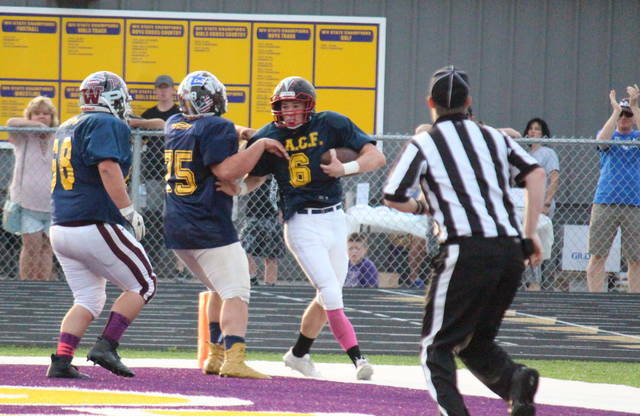 Turner — who finished with 28 yards on two catches, including a touchdown, and a sack on the defensive side — made the most of the opportunity, as he was named the West Virginia all-stars Most Valuable Player in a 47-13 setback to the Ohio all-stars football team. Following the contest, Turner — the first PPHS player to win an MVP award in a the B.A.C.F. football game — spoke about the experience. Ohio — coached by River’s Mike Flannery — charged to a 7-0 advantage with 5:53 remaining in the first quarter, as Monroe Central quarterback Ryan LaFollette capped off a 12-play, 83-yard scoring drive with a three-yard scoring run. The visitors extended the lead to 14-0, when LaFollette connected on a 47-yard touchdown pass to Bellaire’s Gabe Rejonis at the 2:36 mark of the opening quarter. Ohio completed its third scoring drive of the contest, with 8:58 remaining in the second period when Shenandoah’s Nick Miller capped off a three-play, 34-yard drive with a five-yard run. West Virginia — led by Parkersburg head coach Mike Byus — answered on the ensuing possession, covering 40 yards in four plays, as Parkersburg quarterback Kam Mace connected with Turner on a 19-yard touchdown pass with 7:53 remaining before intermission. Parkersburg’s Ahmed Ali added the point-after kick, as the hosts cut the deficit to 21-7. The hosts narrowed the margin to eight points on their next possession, as St. Mary’s Jaiden Smith finished off a four-play, 67-yard drive with a five-yard touchdown run. The point-after kick was missed, however, leaving the Ohio lead at 21-13 with 3:06 remaining until halftime. Ohio closed the first half with a 28-13 advantage, as Belpre’s Tojzae Reams provided 14-yard touchdown run with 11 seconds left in the second quarter. The second half was all in favor of the Buckeye State, as Ohio outscored West Virginia 19-0 en route to a 34-point victory. Miller found the end zone for his second rushing touchdown of the contest with 5:12 remaining in the third, propelling Ohio to a 34-13 lead by way of a 15-yard run. Reams added his second scoring effort of the game with 3:46 left in the third, with a 40-yard interception return. Belpre’s Bailey Sprague provided the point-after kick as Ohio increased its lead to 40-13. Ohio tacked on its final touchdown of the night — a four-yard run by Marietta’s Devon Moss — at the 10:29 mark of the fourth quarter. The point-after kick was good, as the Buckeye State took a permanent lead of 47-13. The contest was halted with 2:37 remaining due to a game-ending injury. Ohio came away with four takeaways on the night, while West Virginia had one interception and a fumble recovery. The Buckeye State also claimed a wide 25-13 margin in first downs and were flagged 10 times for 75 yards, compared to seven penalties for 80 yards by the hosts. The visitors also out-gained West Virginia 382-255 in total yards, which included a 258-102 advantage in rushing yards. Ohio — which rushed 48 times for 258 yards — was led by Miller who produced 87 yards on 15 carries. Reams was next with 66 yards on five attempts, while LaFollette followed with 56 yards on 18 carries. Rejonis added 22 yards rushing on three attempts, while Shenandoah’s Clint Wikander provided 22 yards on two carries. Waterford’s Teddy Smith was next with eight yards on two carries, while Moss provided three yard on three attempts. LaFollette finished with 3-of-7 passing for 124 yards, with Rejonis leading the way in receiving with one catch for 47 yards. Reams followed with one grab for 46 yard, while Cole Hinerman, of River, had one catch for 31 yards. Jaiden Smith led the West Virginia rushing attack with 69 yards on 15 carries, followed by Mace with 41 yards on eight tries. 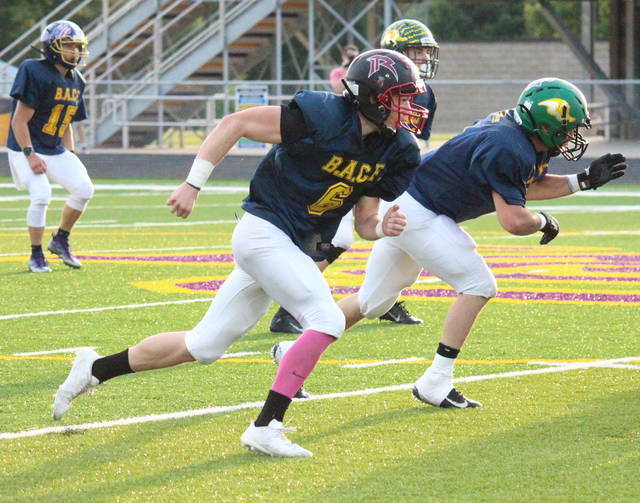 Mace also completed 11-of-27 passing for 153 yards, throwing one touchdown and three interceptions. Parkersburg’s Seth Dailey led the hosts’ receiving corps with five catches for 85 yards. Ohio has now defeated West Virginia in back-to-back meetings of the B.A.C.F. Football Classic, however, the Mountaineer State maintains an all-time series lead of 15-10. Scott Jones can be reached at 740-446-2342, ext. 2106.